Nobody likes a grayling until nothing else bites. Then that bland-colored pushover that’s painted like a gray winter sky and has a nasty maw like a whitefish becomes everyone’s little superhero. Only then do most anglers notice how incredibly cool grayling look and that their sailfish-like dorsal fin, their bluish tail and their random black spotting, more than make up for their reputation as easy fish that don’t jump. My father and I continued to beat ourselves up trying to find more trout while every minute or so Letherman shouted, “There’s another one.” Letherman, who had badmouthed my father and me for casting to grayling in front of camp each morning, was becoming the grayling’s most vocal supporter. And that’s not rare: Throughout their natural range, which extends from western Alaska east to Hudson’s Bay, Canada, then south into parts of Manitoba, Saskatchewan, Alberta and British Columbia, the grayling often saves the day for frustrated anglers waiting on salmon runs or anglers and hunters who are “weathered-in” because their planes are grounded. Grayling, unlike salmon and steelhead, are not anadromous, meaning they don’t run to and from the sea, so they are abundant through most of their range and they are usually willing to play. Montana also has native grayling, most pronounced on the Big Hole River south of Butte. Additional populations are found on the Ruby River; lesser numbers on the Madison. 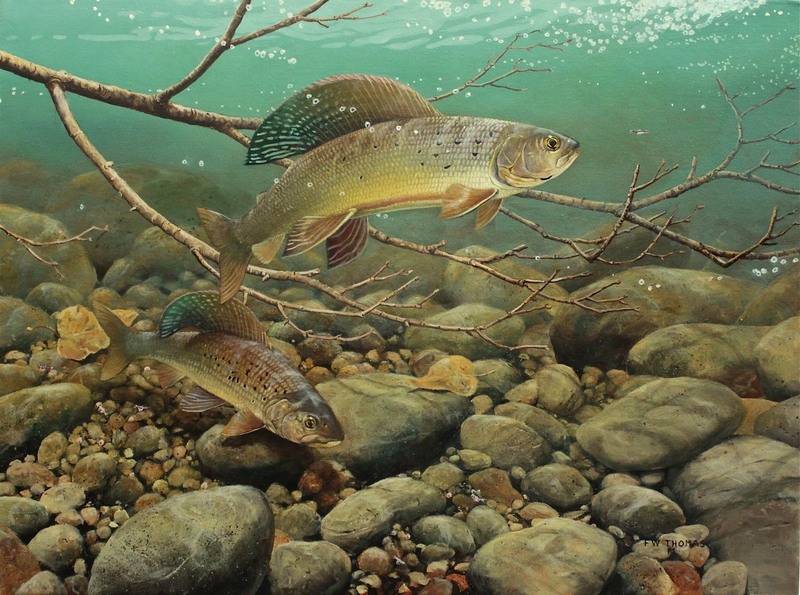 Here, too, grayling are regarded as second-class citizens with most anglers focused on the larger and more brightly colored brown, rainbow and brook trout. But even in Montana grayling may save the day. To illustrate, once I was serving as a location scout for a film crew. It was a highly professional, but slow-moving affair, and the set-up at each location was painfully slow. I was in charge of putting the angler — in this case photographer Brian O’Keefe — onto fish right when the cameras began to roll. At least that was the idea. Of course, the Big Hole’s trout didn’t cooperate and everyone was getting snippy. Then, just as we were about to call it quits and move to another location (a four-hour grind, I assumed), O’Keefe cast a bushy dry fly onto the Big Hole’s glassy surface and set the hook when a fish grabbed it. His surprise was as great as mine when he slid a 17-inch grayling to hand. He accurately described the surprise catch, and the producer and O’Keefe’s sidekick on this shoot, Dawn Wells, a.k.a. Mary Anne on “Gilligan’s Island,” wore broad smiles, knowing we’d pulled a rabbit out of the hat. Grayling saves the day again. Grayling aren’t abundant on the Big Hole which can be highly dewatered and rise to lethal temperature for trout and grayling during summer. But any angler who cares to catch one can focus on the upper river between Wise River and Wisdom with fair chances to take them on dry flies. That’s the grayling’s most notable attribute — they’ll eat egg imitations and small nymphs, too, but they really hit flies floating on the surface, including all sorts of mayfly and caddis species, plus ants, beetles, craneflies and even wasps. Anglers praise grayling for being somewhat less than discerning; they’ll smack general attractor patterns like Parachute Adams, Elk-Hair Caddis Royal Wulffs, Stimulators and Trudes just as quickly as they’ll take a precisely tied size-22 down-wing Trico spinner. That, of course, makes this fish great for beginners. Grayling are opportunistic so anglers catch them on a variety of nymphs and streamers, too. And grayling have to be opportunistic; they live in cold environments and have to feed recklessly during spring, summer and fall. If they are not fit, with fat reserves to sustain them through winter, they’ll likely be dead by March. If for some reason you can’t take grayling on top, drifting Bead-Head Pheasant Tail nymphs, Hare’s Ears and Prince Nymphs through the pools, usually produces strikes. Smallish size 8 and 10 Woolly Buggers and Muddler Minnows, drifted or slowly stripped, are sure bets, too. Fishing dry flies for grayling is a lot of fun, partly for the hookup and fight, but mostly just to watch those fish take the fly. I’ve often laughed at grayling that leap out of the water to take the fly “on the down,” something that takes getting used to. Beginning anglers often pull the fly away from a fish as it is airborne and before it has a chance to land on the fly. No worries; unlike a wary trout, which usually scoots away with a poor cast or an unexpected surface disturbance, grayling seem OK with it all. Rip a line over their heads, land a fly heavily, miss them on the hook-set, and they’ll still come back for more. When fishing grayling you have to carry reasonable expectations. The world-record grayling weighed just over 5 pounds. The average grayling, including on the Big Hole, probably measures 7 to 10 inches long. A giant on the Big Hole would be 16 to 18 inches. In Alaska and Canada, 20-inchers aren’t uncommon with the average size being 10 to 14 inches long. Grayling, as you might imagine, do not grow fast. Studies in Alaska show that a 12-inch grayling, in most cases, is 6 or 7 years old. Some grayling have been “carbon-dated” to 30 years old. Because grayling are modestly sized, they are a perfect fish to test your 2-, 3- and 4-weight outfits. With the new wave of super-lightweight rods available these days, including a variety of fiberglass models, you can hook a 10-inch grayling and feel like you’re fighting a baby tarpon. Grayling are underappreciated in Montana and the U.S. in general, I believe. But they do have sort of a cult following in Europe. And some Europeans actually fly to Alaska and Canada strictly for an opportunity to catch giant grayling. Many head to the super-remote Ugashik Narrows of Alaska where 3- and 4-pounders are caught every day during summer and fall. Others head to the Northwest Territories and float remote and challenging rivers trying to locate the holy grail — a 5-pounder for the record book. I’m not really into the records, but I do like grayling and I’ve spent time specifically looking for them on the upper Big Hole. My favorite time to do so is during fall, when water temperatures cool and the angling hordes head away, their summer vacations fulfilled. At that time I drive leisurely along the highway between Wise River and Wisdom and pull off at likely looking points. In the afternoons grayling and brook trout rise to Baetis mayflies so they are easy to locate. It’s a pretty low-stress affair: I just tie on a small, size-18 Parachute Adams to a section of 5X tippet and cover rises when they occur. The fish aren’t picky, and after feeding heavily during spring and summer, they are as strong as they’ll ever be. The hatch and the grayling rise lasts all afternoon, fading around 5 p.m. as the sun sets and illuminates fresh snow on the Anaconda Mountain Range. By that time my hands are usually getting cold and my fingers stop working. I’ll reel in, walk to the truck, pour a cup of coffee and drive away from rising fish always wondering, Why don’t more people like grayling?